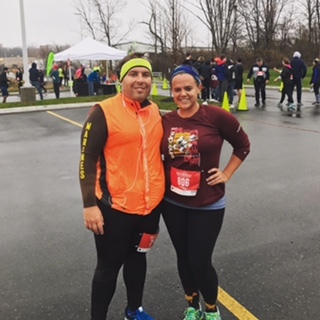 Last year Mike and I visited my family in Indianapolis and decided to run a 5K on Thanksgiving Day before we stuffed our faces. 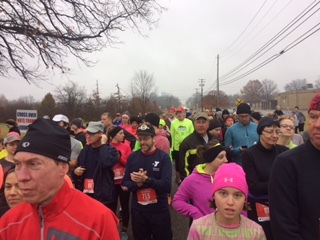 I felt that it was a necessity that we run a race on Thanksgiving Day again this year, so we set out to search for a local race close to Poland, Ohio. 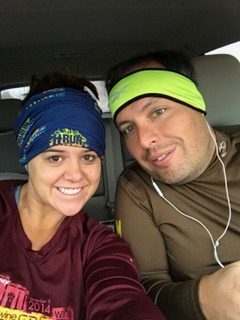 We stumbled upon the Thankful Four Miler presented by Second Sole and decided that it was a must do. Ok, we may have been won over by the pun. The race had a 9am start time, which was good because the night before we had been busy running all around Youngstown, Ohio (its a long and not terribly interesting story) and needed some sleep. It was nice to wake up and have some time to actually wake up compared to the 5:30am race starts we have become accustomed to. 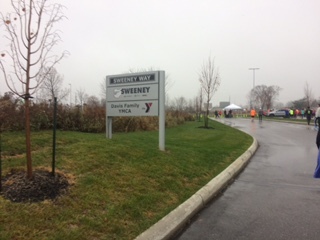 We arrived at the Boardman YMCA at about 8:40am and headed to the start line. 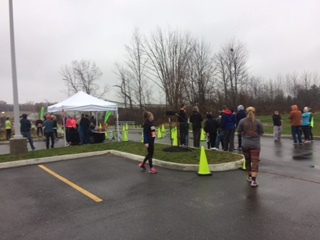 There was no expo for this race, instead it was a packet pickup at Second Sole. It was a quick and easy process to pick up our race bibs and swag, Oh, and I may have done some shoe shopping while I was there, but it was for running shoes, so its all good. The swag for this race was simple. 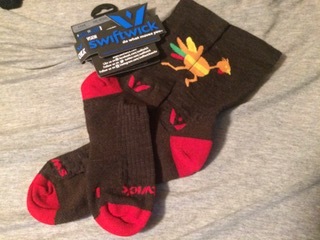 We received a nice pair of Swiftwick mid calf running socks with a turkey on them – a turkey! The temperature for the race was predicted to be in the lower 50s/upper 40s. For me this is a very difficult temperature to dress for because I can easily get overheated. I decided to wear black yoga pants, my Disneyland half marathon running tank top, my runDisney Wine and Dine long sleeve tech shirt, new Swiftwick turkey running socks, Run and Ride Cedar Point Buff, VSX incredible sports bra and, Asics Gel-Noosa Tri-Fit 10s running shoes. I ended up taking off the long sleeve shirt halfway thru the race so I’m glad I had made the decision to wear a tank top underneath. We arrived at the race about 20 minutes before start time and headed straight to the finish line. Yes that’s right I said the finish line. A few minutes before the start of the race, the race directors walked us to the start area which was a mass start with no official start line. Thus everyone had the same start time making it hard to know your official race time. The funny thing about Casual Runners is we tend to obsess over the details of a race prior to race day. We examine course maps with a fine toothed comb, we make note of water stations and bathroom stops, and certainly know the topography of the course (hills, climbs, drops, flat stretches, etc.). This being a local race, there was little information available on the course itself other than the start, finish, and length. Seeing as Mike grew up in this town, I asked him what we could expect. Other than telling me that we would be running in neighborhoods, he did not know. So yeah, he was no help. I guess we would be flying blind on this one. That’s ok, Casual Running is an adventure! We started out in a mass start and took a right hand turn onto an access road behind the Township Administration Building. This was when I noticed just how fast the field was, and I mean FAST. As there were walkers and runners in the field, we had to be careful to safely pass the walkers and to not get hit by the younger kids who were darting in and out of the more experienced runners. We crossed over a major road (Market Street), which was safely shut down by the Boardman Police – a big shout out to those officers who came out on their holiday morning to keep us safe on the course! Then we started making our way around the neighborhoods and…whoa! Wait a second, where did those hills come from??? As the start of the course was super flat, I allowed myself to believe that it would remain this way, but somehow the neighborhood streets had some not-insignificant climbs to them. So yeah, we were in for a hilly Thanksgiving treat. Hills are not my forte, so, while neither Mike nor I were running for time, he did run ahead as he wanted to use this as a harder training run. This being a local race, I did see a couple of strollers and a dog or two. It is always good to be on the lookout for such things as, at one point, I noticed a runner who stopped to clean up her dog’s poo in the middle of the street. Now, I applaud her for cleaning up after her pet, however, in this situation, coming to an abrupt stop in the middle of the course poses a risk to other runners, and I did see one runner who did not see her and had to avoid running into her at the last moment. Just a word of warning. 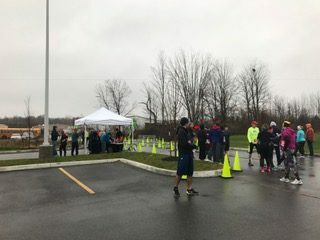 We did see a couple of families who came out to cheer us on, and one family in their pajamas taking a selfie with the runners as their backdrop, they all looked like they were very much enjoying themselves. There was one water stop at about the 2 mile mark. For most runners, this was sufficient for a race of this distance (4 miles) in colder race conditions. As I like more frequent hydration, I did carry a bottle of Powerade with me. I did notice that these were the largest paper cups I’ve ever seen at a race – they were using ones donated by sponsors. I don’t know why this amused me so much, but it did. Plus, a big shout-out to the volunteers who came out on their holiday morning to support us, thank you! I tackled a few more hills (anecdotally I felt that the hills in mile 3 were the worst, but I do not have a course map to confirm this), and then crossed back over the main road where, again, the Boardman Police were doing an excellent job of stopping traffic for us. The end of the course was the beginning in reverse. 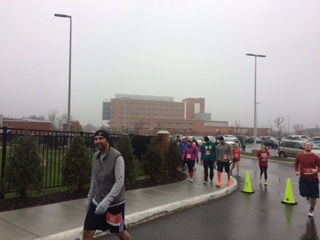 There were a few spectators over the last quarter mile or so cheering us on, and of course we saw the smattering of runners who already finished who were taking advantage of the closed roads to extend their 4 mile races into longer training runs. Mike finished ahead of me, and I saw that he walked back out to run the final straightaway with me. The whole race day atmosphere was relaxed and fun, and this made for a nice way to end the race as we crossed the finish line together. Sorry folks, the moose out front should have told you no SMOs for this race! Actually, he did, but I have become very accustomed to only running races where a SMO is included, so it was weird not to get one at the finish line. I will say once again though the socks were pretty nice for a local race. Mike had pulled me a water bottle when he finished the race because he was concerned there would not be any left for me when I finished. With having this race combined with a 3K walk it made it so that most of the walkers were finished before I crossed the finish line, which made water bottles at the end sparse. While I think that organizers, overall, did a nice job for a small, easy, local race, I am always concerned when they run out of basic items such as water, before every runner (and in this case, walker) finishes. I reused my playlist from the 2015 Christmas Story 10K because I was ready for some Christmas music! I definitely enjoyed this playlist and found myself frequently singing along (people probably thought I was crazy lol). If we were spending Thanksgiving in the Youngstown area again I would definitely run this race. This race is definitely worth the price! It was a challenging course and made me feel a little less guilty about spending the rest of the day eating knowing I ran a hilly four miles that morning.